Slumped into a high chair inside the dim lit eatery, surrounded by the team of interns, teeth lustfully digging into the scrumptious 18” slice of crispy cheese filled pizza; my mind wandered back to the conversation I was having with Kunal (Internshala advisor) back in February. Reasoned Kunal when I first told him about the concept. Completely drained and exhausted after Internfair (multiple times we had to rescue the event from the brink of ‘no show’), I had to concede that Kunal had a point and to attempt the daredevilry again could prove suicidal for Internshala. And unlike Internfair, InternSaturday was going to be an on ground event and we were absolutely unprepared for the level of complexities associated with it and hence, we decided to let it go for now. “Do you want some more coke?” Sidharth interrupted my chain of thoughts. Standing in front of me was the man behind the show, a 19 year old intern (! 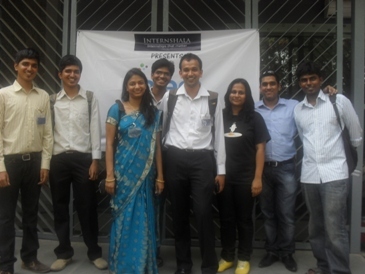 ), who gave Internshala the opening it was looking for to make InternSaturday happen despite all the odds. Despite having decided NOT to do InternSaturday this year, back in April when I asked Sid to intern with Internshala in the summer, he asked what he would be working on. “InternSaturday”, I said without a moment of hesitation. For me Internshala has always been about seizing the moment and converting the half chances. And with someone as talented and as versatile as Sid leading the show, I was confident that we had more than a decent shot at making InternSaturday happen. Rest, as they say, is history! After 2 months of absolute madness, thousands of calls and hundreds of rejections from the companies regarding sponsorship, innumerable visits to Delhi in scorching heat of May and June, and working in often waterless and powerless home office in Gurgaon, here I was slumped inside this pizza shop at 7:00 PM on June 30th, Saturday – THE Saturday. Too drained and too overwhelmed to respond to Sid’s question asking if I wanted more coke, I had only one thought running in my mind – We had done it! Power of believing: – InternSaturday was a new and untested concept and hence we knew that it would be met with scepticism. However, in current economic climate, it seems no company wanted to bet its money on a horse which was running for the first time and we were unable to convince corporate to invest in the idea. However, at no point, we thought of scrapping the event. If the going proved tougher than we thought, it only meant we had to innovate more. But the show must go on! Power of innovation: – With no sponsorship coming in, we went back to drawing board multiple times. No advertising money meant we had to rely entirely on Social Media and we ran one of the best executed campaigns on facebook (I am still in love with this motion ad). 5 star venue and menu were no longer an option and we decided to go after govt. run auditoriums and stumbled upon National Science Centre (what an apt ambiance!) which not only was affordable but also allowed us to decouple food from venue and pass on the food costs to students. Instead of hiring professionals, we turned to friends and interns to lend us the cameras and become photographers and videographers for the day and so on. In hindsight, some of these limitations proved to be blessings in disguise and prevented us from getting distracted. Yes, it would have been nicer if we could provide students with a free 7 course lunch but that was not the primary reason (nor we wanted it to be) why students were coming to the event! Those who have ever flown Indigo would know how a no frills flight can still be a great experience and we wanted to deliver just that! i). Mrs. Aga lives in Pune and she had earlier agreed to keynote the event because she was going to be in Delhi on 29th anyway due to some other meetings she had. However, a week before the event, all her other meetings on 29thwere cancelled and she flew in from Pune to Delhi just for InternSaturday alone. ii). Avishek (the brand quiz master) undertook a 24 hours long (each way) self financed train journey from Ranchi to Delhi and back in sweltering heat just because he wanted to help. iii). Santosh (the MC guy) was informed about his role only at the last minute and despite such a short notice, he managed to run the entire day’s show with no glitches and with par excellence time management. The power of Interns: – Internshala’s team of super interns again demonstrated why they can give any professional run for his/her money. Every aspect of the event – sponsorship, coordinating with speakers, logistics, social media, website, and publicity was handled by the interns and the professionalism and clinical precision with which the show was executed can put any event management company to shame. If you find this claim exaggerated, I would strongly urge you to read through the testimonials once again. The devil lies in detail: – This is more of a tactical advice and a clichéd one at that. No amount of planning and detailing can be enough for an on ground event. Things invariably will go off the track and Murphy’s law would be at play but it helps tremendously if you have sat down with your team prior to the event and done a nut and bolt level planning (for example we carried glue, cello tape & scissors, and hammer & nails– all 3 because we did not know which one would work best to hang the banners on venue). Always have a plan B and plan C in place! For me InternSaturday was quite a journey – an emotional and learning packed one – and I can not wait to see InternSaturday becoming a national event soon. How was the experience for you, do let me know in the comments. How Internshala team members spent their first stipend!